Fourth year of college. Fourth school down. Yes, my friends, I am now attending BYU to get my bachelors degree, and this marks the fourth school I have attended since my high school graduation. The past schools I have gone to (Weber, SLCC, and then I finally received my associates at UVU) have all been very similar to each other: Commuter, a good number of non-LDS students, small class sizes, big college campus. The work load was never overwhelming, but was just enough to keep me busy, stretch my mind and help me learn, and still leave me just enough time to watch one or two netflix episodes afterward. And then, there were my roommates. Starting at UVU, I began living in BYU off-campus housing, where all my roommates attended BYU. I saw that their workload was much greater than mine, the policies at the school much different than any other school I had been to, and their overall stress level was just higher. Despite these positive contributing factors, this did not calm my nerves for the much anticipated first day of school. Hilariously so, on the bright side. It all started the Sunday night before classes started. I had spent most the weekend at my parent's home to gear up on sleep and some relaxation before I jumped into this semester. And because I was dreading the start of this school year, I procrastinated driving back to my apartment in Provo. And so, I got a late start to the ride home. Anyone who knows the I-15 in Utah knows the ridiculous amount of construction that is currently taking place between Provo and Sandy. It just gets more ridiculous after nine p.m, when there are nightly lane closures. Of course I had all intentions to head back to Provo before nine, but low and behold . . . that didn't happen. It wasn't too bad, but it wasn't the most relaxing of drives home either. And then came the time when I arrived in Provo. Now, anyone who knows Provo knows how AWFUL parking is. Trying to park in Provo is similar to trying to fit into a sardine can. And because I had waited so long to get home, every single parking space was taken at my apartment complex. I circled around and around for about a half an hour until I finally parked illegally, dumped my laundry inside my apartment, and headed back to my car to find a place to park. Ten more minutes circling the block and no luck. I was becoming more and more frustrated and convinced that I would have to park my car at least a twenty minute walk away from my apartment when . . . Wait seriously? Is that a spot right by my apartment? It seemed too good to be true, but I parked there anyway. I stepped out and stared at the crumbling sidewalk. Okay, so there's no red paint on the side . . . This is good . . . There's no sign saying no parking . . . I'm not like the guy in front of me and right in front of the fire hydrant . . . Seems okay . . .
Again. It seemed far too good to be true, but I was desperate, so I left my car and walked back to my room, declaring to my roommates that I wasn't sure if I parked legally or not. I was pooped, but still had to shower, write in my journal, and socialize before I got to bed. Before I knew it, and opposed to my liking, I finally crawled in bed around midnight. My normal bedtime is 11:30 at the very latest, but I like to be in bed by around10:30. So you can imagine my overall frustrations with life at this moment. Despite my exhaustion, I just couldn't sleep. My mind was racing and my nerves were wracking in anticipation for tomorrow. I felt like every cell in my body was on edge and I could only lay there stiff as a brick, trying to relax while my eyes lay wide open. I woke up throughout the night, anxiously checking my phone to make sure I hadn't slept in. I woke up to every creak, cough, or sound that came from my apartment and roommates. And before I knew it, it was eight o' clock in the morning: generally a half hour later than I get up. As my alarm chipped happily, I did the only thing I could think of to do at that moment: pull the sheets over my head and say to my roommate, "I don't want to go to schooooooooooool." I lay in bed for twenty-five minutes, going back and forth between deciding if I should drop my first class just because I was tired, and it was an elective anyway. I pulled up my computer to drop the class . . . and then . . .
"This is ridiculous," I said to my roommate, but mostly to myself. "I have to at least give it a try." I glanced at my clock. I had fifteen minutes to get ready for class. I can just throw my hair back into - NO. THIS IS THE FIRST DAY OF SCHOOL, THE ONE DAY WHEN I ACTUALLY HAVE TO TRY TO LOOK GOOD. YOU HAVE THE WHOLE REST OF THE SEMESTER TO LOOK LIKE CRAP, CARMEN. Frantically, I changed clothes, ran a brush through my hair, and threw on make-up. Now with my current schedule, I am on campus on average from 9-5 everyday, so I had to pack a lunch. I threw open my cupboard and . . .
An overwhelming stench of death overtook me, and I covered my nose. My potatoes. My poor, delicious bag of potatoes were now rotten and disgusting. Nose and eyes stinging, I set the bag of potatoes by the door to remember to throw them away on my way out. Guess I would just have to make a sandwich. I pulled down my bread and peanut butter and threw a measly sandwich together. I tossed it in my backpack along with two granola bars and a handful of potato chips. As I closed my bread, I did a double take. Was that mold I see on the large amount of bread I had left? Chucking it in the garbage, I went to the fridge and grabbed my last cup of dairy-free yogurt and a spoon. Cautiously, I balanced my yogurt cup, spoon, planner and notebook, and the bag of rotting potatoes in my hand and hastily left my apartment, now with little to no time to get to my class. I dashed across the parking lot to the dumpster, heaved the potatoes inside, and then . . .
No way! Is that a shortcut?! Sweet! I raced down the grass-grown pavement that ran behind my apartment building and a neighboring fence. Judging by the direction it was headed, I suspected it would lead me to the sidewalk on the opposite side and closer to the school! Letting out a low growl, I turned on my heel with my notebook, planner, spoon, and yogurt in hand, and sprinted back around my building and towards an actual pathway. Now, anyone who knows BYU knows how many ridiculous stairs there are to get onto campus. And so I faced what I dubbed: Satan's stairs. I took them two at a time, now gripping my maxi-skirt in hand so as to insure that I wouldn't trip over it. I don't know why I thought I would be able to eat my yogurt on the way to class. I was sprinting and holding a ridiculous amount of items because I thought it would save me time to hold them instead of pausing to place them in my backpack! There was no sense in carrying these things anymore. I could place my stuff down on the bench and place it in my backpack. Hiking up my skirt more, I began to sprint towards the bench and . . .
Running = sweat = sweaty hands = not being able to hold onto anything. My planner, notebook, yogurt, and spoon fell to the ground, and I stumbled as my skirt caught around the tip of my toes. I knelt down and shoved everything inside my bag, and took off once again. There were still a good amount of students on campus, so I knew I still had a bit of time to get to class. I was breathing heavily at this point. I knew without having to look in a mirror that my entire body was as red as my hair. I began to wonder why I had even showered or put on make-up if I was just going to sweat it all off. I found the building I needed to be in, and passed a kid holding a bloody tissue to his nose. Well it could be worse. I could be like that kid. I sped walked through the second most confusing building on campus, and breathed a sigh of relief as I found my classroom. As I walked in, the bell rang, and I jumped and let out a slight gasp. A bell? Seriously? This school has a bell? I haven't had a bell since high school! I took the nearest seat, and the teacher began class. I, unfortunately, was still panting and could feel sweat dripping disgustingly down my forehead. I had cooled down and had rebuilt my energy by the end of class, and then headed to my second class which, thankfully, wasn't too far away. To add to this, my professor had even let us out of class a couple minutes early! There was no way I would be late to my next class! I got lost trying to get out of the building, jumped when the bell to leave screeched through the hallways, and managed to find the exit on the side that was farthest away from my next class, simply because it was the exit with the lowest crowd. I figured out why as soon as I saw my surroundings and figured I had just added an extra minute to my walk to class. I sped walked to my next class. As I entered the door, I saw that the entry and hallways were congested with students attempting to do just what I was doing: get it. "You have got to be kidding me," I muttered under my breath. When I managed to squeeze my way through, I saw that one of the stairwells was under construction, and that students were having to slowly snake their way through the crowd to the stairwell on the other side of the building. "Oh, heck no." I said, and I took off downstairs as opposed to the direction I actually needed to head to: the second floor. I raced down the stairs, sprinted across the building to another set of stairs, ran up that one, and it gave me perfect access to the staircase leading to the second floor. "Brilliant!" I said once again to myself. I maneuvered easily to the next staircase, and saw a kid on crutches squeezing his way through the crowd. Well it could be worse. I could be that kid. I ran upstairs, and quickly found my classroom, as well as my friends who were in that class. I plopped down in a seat next to them, and placed my water bottle, pen, notebook and planner on my tiny, pull-out lap desk. My friend let out a laugh and said to me, "Next blog post?" "Yuuuuup." I said, gathering everything up. Next was work. I love my job, and was excited to be able to sit, relax, and do something I actually knew I was good at for a couple hours. Water splashed my skirt, shirt, and shoes. I was too exhausted to react at this point. I refilled my water bottle, and sat my little soaked self down at my desk. It was now around 11 o' clock, and I had yet to eat anything. My body was NOT happy with me. I ate my now warm yogurt incredibly slow, munched on my granola bars, and then pulled out my sandwich. I unwrapped the plastic bag protecting it, then looked at the bread. Little speckles of white dusted the edges of the sandwich. My stomach growled.
. . . was it worth it?
. . . maybe I was just imagining this. I turned to my coworker and interrupted the conversation she was in. "Does this look like mold to you?" I asked. "Yeah." she said, then turned back to her conversation. "Dang it." I said, and chucked it in the garbage. I ate the handful of potato chips I had packed, and found another bag of potato chips shoved in my cubby. I thanked my past self for putting those there, and then ate three milkways laying around the office. A feast made for royalty. I had begun to wonder why I had come to BYU. Why on earth had I done this to myself? Was it a mistake? 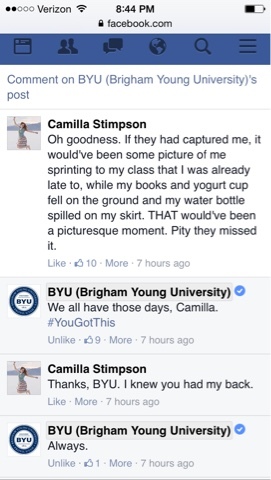 I was grateful to know that BYU had my back. Perhaps I COULD do this. Five o' clock came with no more mishaps beside me just being tired. In my first class, I was informed that I needed a textbook I had neglected to buy. So, I made my way to the bookstore on campus . . .
To see a line that was about as long as the rides at Disneyland. Rolling my eyes, I grabbed my one little textbook, and waited in line. Okay, so he's two years younger. That's my limit when it comes to younger guys. But the way he was acting . . . he had to be younger than 20 . . . He began to talk to me, and I could tell he was hitting on me. Knowing how old (or young) I look, I knew I had to set boundaries quick. And thankfully, he walked right into it. "So, this your first day at BYU?" he asked. "Technically, yes," I said. "But it's my fourth year of college. I just transferred here after I served my mission at age twenty. What about you?" "Oh yes. Yes, it's my first day. I just graduated high school a couple months ago. I'm 18. How old are you?" Glad we established that quick. The conversation turned to him asking me for college, mission, and life advice. He will do great things . . . without me in his life. We were winding through the isle, when a friend standing across from me stopped me. Let me rephrase - we're acquaintances. He remembers me and my name and how we know each other, and I just take his word for it cause he only looks vaguely familiar to me. "Hey! Carmen!" he said to me while giving me a high five. "You're engaged to Eric Lane, right? Or just got married? Congrats!" I stood there dumbfounded for a split second, then came to my senses and said, "What? No, no, no, no, no. That's the OTHER red headed flute player that was in band with us who married him. Not me. Still single." "Oooooh! Ha Ha Ha!" he cackled, "I mixed you two up ALL the time." "Ha. . . yeah I mean it happens . . . " I said awkwardly. I bought my textbook, then met up with a friend. As predicted, we were late to an appointment we both had to made. As we sped walked back to my car where I would drive us, I began relating my day to her. "I mean, the only thing that could possibly make this day worse, is if I got a parking ticket." I said, and we turned the corner and continued to half walk, half jog to my car. I walked to the drivers side of the car . . .
And saw a little, yellow paper sticking out from under my windshield. I laughed. I legitimately laughed at this point. There was nothing else I could do. Blocking the entrance to a sidewalk. Despite the awful start, there were still so many incredible blessings poured on my day. I saw many friends I love and who I hadn't seen in a while. I was generally happy throughout the day, and I had a good story to tell later. I also had air conditioning, which I could NOT complain about, especially after running up 114 stairs in the morning. The days following were less eventful, and less awful. I knew it could only go up from there. But I also have no doubt there are many awkward doors ahead for me.